Freezing fast motion (AKA High Speed Photography), can give some pretty special photographic effects. 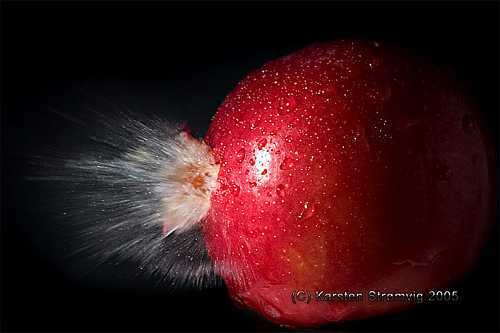 High Speed Photography is used in physics, health research, sports and more. This guide describes how to capture super fast movements using ordinary camera gear and a little home made electronics. I will describes the setup I used the problems I encountered and what I did to solve or work around them. We have to handle shutter lag, synchronize the flash and time the exposure to just the right moment. But the shutter lag of any normal camera is so long that it will be all most impossible to time the exposures. And how do you synchronize the flash with an exposure time of less than 1/6000 second? SO now we need to see how long does it takes the flash to fire. It turns out that the output power of the flash, actually affects the duration of the light, so to get exposure times. If you need exposure faster than 1/6000 seconds, the output needs to be reduced. For more information on the light duration please see the test I ran on my Sigma EF-500 flash. Now we only need to synchronize the flash with the action we want to capture. This can be done in several ways. 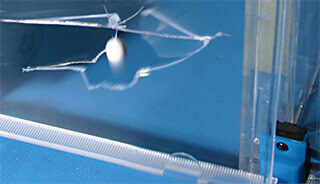 For example synchronizing with a balloon puncture, can be done via sound. 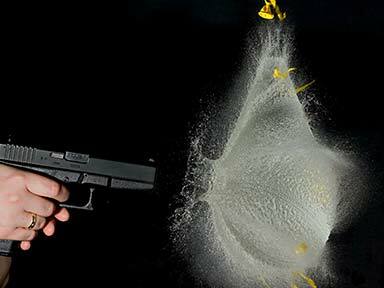 Impact-actions, like a BB Soft air gun pellets, can be triggered with a mechanical switch, like in the picture below. When the pellet hits the cd-cover it’s pushed on to the switch, which then triggers the flash. 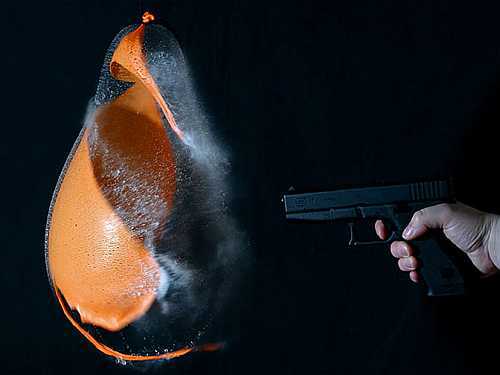 Here is my High Speed Photography setup and work flow (Balloon Shot). Flash: optical slave and 1/16 output power. Camera: Exposure time: 1-2 sec. ISO 100-200 Aperture F 11-16 manual focus. While trying to stay within the best performance on the lens, I either zoom or move the tripod, until I have the desired framing. Focus can be obtained either automatic or manual, but do remember to switch to manual to lock focus, otherwise the camera will try to focus when the lights are switched off. Now it’s time to test the setup and lightning. All lights are switched off and the shutter is set to bulb. To fire the flash I just clap my hands. Then I review the image on the camera, checking for exposure, framing, focus and DOF. The test is repeated until satisfactory result have been reached, and the real photo can be taken. This is done the same way as when testing, but instead of clapping, the balloon is punctured with a needle. Great great great! http://photosimpl.com and diyphotography.net are my masters in photography, thx a lot! 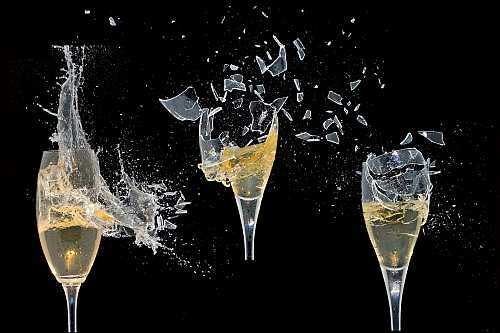 Great photos, I would love to start doing some high speed photography, just need to start saving up for triggers. Triggering is often the most difficult part of the high speed imaging capture process. Because the frame rate is high, (say 1,000 fps) this is 40x the data rate of a normal video camera, and it all need to be recorded at high quality. The data rate is massive, an so the memory or capture time is very short normally. I shoot with 1920 x 100 HD high speed cameras at 1,000 fps, and I have a capture time of 4 seconds at that rate. What that means is 4 seconds of real time action to capture. This, believe it or not is huge in automotive, where the action happens over about 0.5 of a second….or less normally. This means the car impacts, the airbags deploy, and then immediately start deflating, and the car is bouncing off the target and is almost at rest again! We use triggers the car drives over, or impacts, and this then triggers the camera, and records a preset amount of frames BEFORE the impact, say 100 frames before. It does this by constantly recording until the trigger is activated, and then only recording the pre determined amount of frames. This means the trigger can be impacted, and the camera records the approach of the car, and THEN the impact. I use Vision Research M320S cameras, and they are specialist bits of kit costing tens of thousands each. More of my videos can be seen here if you would like to see. You don’t need expensive DSLR to capture high speed objects. It’s about techniques.